Mobile World Congress 2011 is now here and to kick off the show RIM has made a number of announcements, the biggest one being the addition of two more BlackBerry PlayBooks to RIM's tablet family. Joining the already-announced WiFi PlayBook and WiFi + WiMax PlayBook (Sprint 4G), today RIM has announced that LTE and HSPA+ versions of the PlayBook are on the way too. There's no specific word on carriers, or pricing or launch date, but ya know... at least we know they're coming and likely to a carrier near you. Hopefully the wait won't be too long! Keep reading for the full press release. MOBILE WORLD CONGRESS, BARCELONA, SPAIN--(Marketwire - Feb. 14, 2011) - Research In Motion (RIM) (NASDAQ:RIMM)(TSX:RIM) today announced plans to launch two additional BlackBerry® 4G PlayBook tablets during the second half of 2011, featuring support for LTE and HSPA+ high speed wide area wireless networks. "The BlackBerry PlayBook tablet is already being widely recognized for its superior performance, rich web experience, enterprise readiness and deep support for web standards and open development tools. We are now building on the BlackBerry PlayBook's many advantages with support for additional 4G networks that will allow enhanced business opportunities for carriers and developers and unparalleled mobile experiences for users," said Mike Lazaridis, President and Co-CEO at Research In Motion. 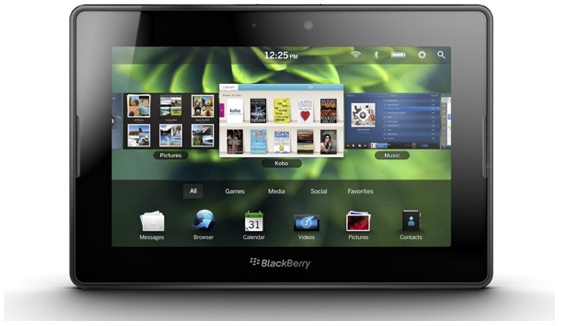 RIM's family of upcoming BlackBerry 4G PlayBook tablets will deliver professional-grade, consumer-friendly experiences that redefine the possibilities of mobile computing. These innovative tablets will each provide users with an ultra-portable design featuring industry leading performance with real-time multitasking and symmetrical multiprocessing, uncompromised high-fidelity web browsing including support for Adobe® Flash and stunning HD multimedia, as well as advanced security features and out-of-the-box enterprise support. The combination of premium hardware features and design powered by the new and highly acclaimed BlackBerry® Tablet OS and open development tools, along with support for carriers' high speed 4G networks, will provide a high performance platform that enables a mobile services revolution.